Marquez wins PM4 fight, knocks out Manny Pacquiao at round 6! The fourth installment of much-awaited match that marks boxing history happened on 9:00 p.m. 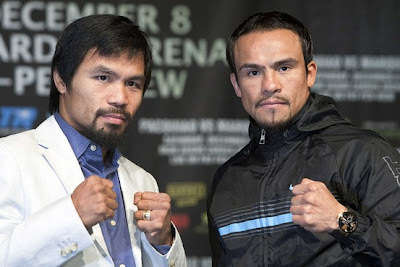 ET / 6:00 p.m. PT December 9, 2012 at MGM Grand Arena, Las Vegas Nevada between Mexican hero Manuel Marquez (54-6-1) and Philippines' pride Manny Pacquiao(54-4-2). 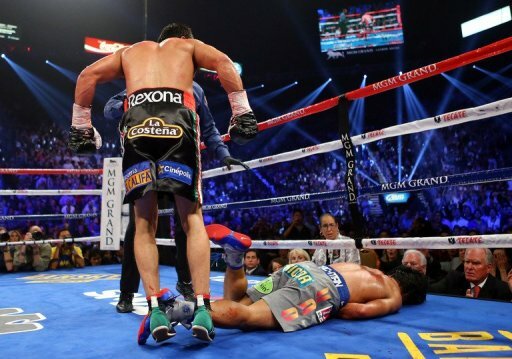 At Round 6, Marquez is victorious through knocking-out PacMan. "I did my best, but that's boxing. I did not expect that kind of punches. ", bloody Pacquiao said. Pacquaio said he is willing to meet Marquez on their fifth fight. "I knew he was gonna do a 1-2 punch, so I stepped to the side. ", Marquez said while detailing his winning moment. At the first round, Pacquiao showed good movement but Marquez looked defensive as well. The welterweight match between two boxing icons is planned for 12 non-title fight. Kenny Bayless served as the official referee of #PacMarquez fight. More than 16,000 crowd filled the arena both mixed of Mexican and Filipino supporters. Kiko Pimentel's cousin, Chelsea Emata sang the Philippine National anthem. Marquez weighed in at 143 pounds while Pacquiao is higher by 4 pounds during the official weigh-in December 8. On the pre-fight interview, Pacquiao said that he feels good and ready for the fight. "We developed my right hand. I want a convincing win." On Twitter Philippines, #PacMarquez trended at number 1 spot before and during the fight. Filipinos were full support to the boxing pride which is also a Congressman in Sarangani. According to reports, Pacman dedicated the fight to his province and Southern Mindanao which was severely damaged by Typhoon Bopha. Pacquiao and Marquez first clash happened on 2004 but ended-up in a draw. 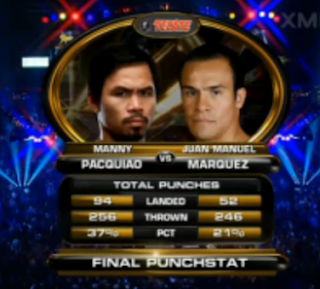 2008 and 2011 fights favored the Pinoy pride. Marquez camp says that they should win those three fights. Manny Pacquiao is the first eight-division world champion, in which he has won ten world titles, as well as the first to win the Lineal Championship in four different weight classes. PacMan was named "Fighter of the Decade" for the 2000s (decade) by the Boxing Writers Association of America (BWAA), World Boxing Council (WBC) and World Boxing Organization (WBO). He is also a three-time The Ring and BWAA "Fighter of the Year," winning the award in 2006, 2008 and 2009, and the Best Fighter ESPY Award in 2009 and 2011.